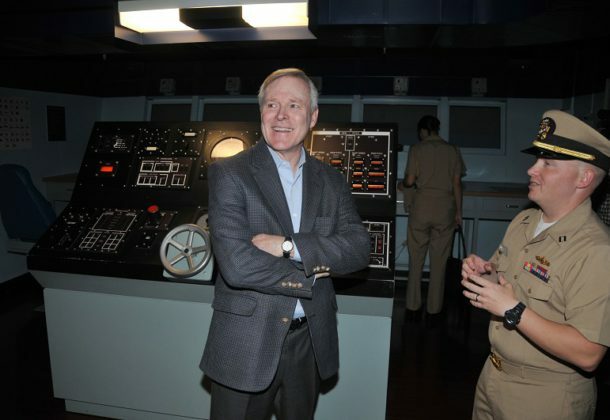 The Pentagon, citing increasing costs for national defense given the price and sophistication of weapon systems, the continuing rise of threats like cybersecurity attacks, and growing retiree expenses, is anxious to cut costs wherever it can, outgoing Secretary of the Navy Ray Mabus tells The Connecticut Mirror. For those reasons, Mabus supports another Base Realignment and Closure round. He said all Navy facilities, including submarine bases like the one in New London, CN, would be scrutinized in a new BRAC round, but he indicated the impact on the Navy and Marine Corps would be less severe than on the Army or Air Force. The P-8A environment, safety and occupational health team at Pax River earned the Secretary of the Navy’s FY2015 Environmental Excellence in Weapon System Acquisition, Large Program environmental award. Dennis McGinn, assistant secretary of the Navy for energy, installations and environment, presented the P-8A ESOH team with the award last week. 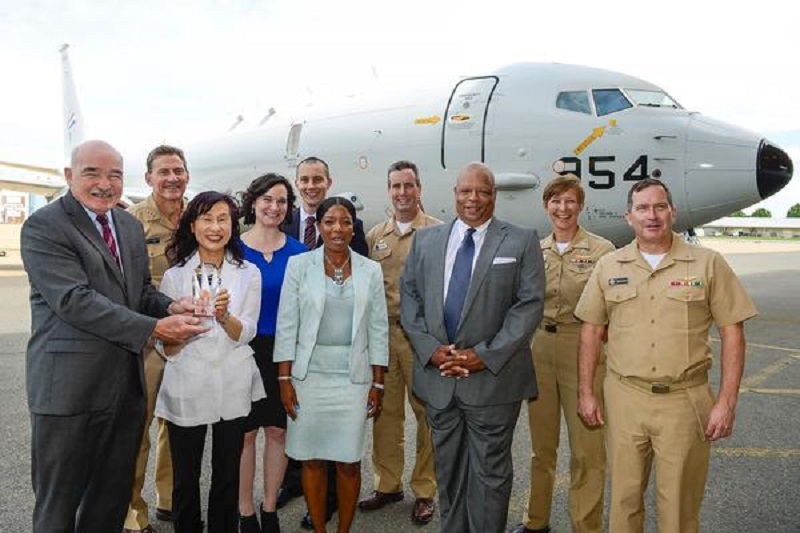 The Maritime Patrol and Reconnaissance Program Office — PMA-29 — integrated ESOH into the life-cycle management of its P-8A aircraft systems early in the acquisition cycle and streamlined hazardous materials tracking, among other accomplishments, NAVAIR News reports. Air Force Secretary Deborah Lee James pledges more funds into a new energy consumption and usage program, Federal News Radio reports. “We are going to have to make sure there’s some money there. Like with any new approach you perhaps start on the smaller side and then you scale from there,” James said Aug. 4 at a New America event in Washington, D.C. In February, AFSec James directed the USAF to set up an office of energy assurance. James also told the audience at the think tank event that adversaries could target US military energy sources as a means to disrupt cyber operations, National Defense reports. AFSec James announced last week that the Air Force will set up interim F-16 fighter jets training units to increase pilot output, Air Force Times reports. Plans to stand up two new training locations by the end of December 2016 will consider Luke Air Force Base or Tucson Air Guard Station in Arizona, Holloman Air Force Base in New Mexico, or Joint Base San Antonio’s Kelly Air Guard Station in Texas. China is upset over South Korea’s plan to deploy the Terminal High Altitude Area Defense, or THAAD, system, believing it is capable of tracking missiles inside China, Military Times reports. A senior US military official said that the missile defense system will only target North Korea, not China. China has reportedly canceled events involving South Korean entertainers. Six companies have been selected by NASA to help develop prototypes and concepts of deep space habitats for future manned missions to Mars. They are Bigelow Aerospace, Boeing, Lockheed Martin, Orbital ATK, Sierra Nevada Corporation’s Space Systems, and NanoRacks. The six partners have about 24 months to develop ground prototypes and conduct concept studies for deep space habitats, Live Mint reports. Deep Space Industries reports company plans to launch the first private mission to an asteroid by 2020, engadget reports. The California-based asteroid mining firm will build a successor to its Prospector-X test craft called Prospector-1, which will land on an asteroid as it passes near Earth. The US Marine Corps has begun a full reset of its CH-53E helicopters to address an issue that came to light after a fatal 2014 crash, UPI reports. The work on 147 of the aging Super Stallion heavy lift aircraft is aimed at increasing the number of operationally fit aircraft and addressing systemic readiness issues approaching unsustainable depths. Washington Exec reports Vencore Inc. chosen to provide cybersecurity support to the Naval Air Systems Command Cyber Warfare Detachment program. Vencore will work to bolster Navy systems and platforms and compete to provide advanced research, integration, and development support and services on various NAVAIR platforms. As the military continues to build its cyber forces and institutionalize a professional cyber corps, top officials are calling for a cyber persistent training environment. While Cyber Command conducts large-scale exercises every year such as Cyber Guard and Cyber Flag, more is needed, C4ISRNET reports. The Army was recently tasked by DoD to take the lead. A low-cost unmanned aircraft system that powers an airborne drone via a tether could give search and rescues teams a continuous eye-in-the-sky, MSN reports. See video of the drone here. American Electronic Warfare Associates, California, MD, is being awarded a $91,293,935 indefinite-delivery/indefinite-quantity, cost-plus-fixed-fee, cost-reimbursable contract for engineering, management, and technical services in support of the Naval Air Warfare Center Aircraft Division’s Integrated Battlespace Simulation and Test Department. Work will be performed in Patuxent River, MD, and is expected to be completed in August 2020. No funds are being obligated at time of award. Funds will be obligated against individual delivery orders as they are issued. This contract was competitively procured via electronic request for proposals; three offers were received. The Naval Air Warfare Center Aircraft Division, Patuxent River, Maryland, is the contracting activity (N00421-16-D-0013). The Boeing Co., St. Louis, MO, is being awarded $18,361,373 for cost-plus-fixed-fee modification 01 to task order 0218 against a previously issued basic ordering agreement (N00019-16-G-0001) for additional production engineering support for the installation and integration of systems required for the F/A-18 E/F and EA-18G. This effort also includes Electromagnetic Aircraft Launch System follow-on test and evaluation support. Work will be performed in Patuxent River, MD (75 percent); and St. Louis, MO (25 percent), and is expected to be completed in February 2017. Fiscal 2015 aircraft procurement (Navy) funds in the amount of $18,361,373 will be obligated at time of award, none of which will expire at the end of the fiscal year. The Naval Air Systems Command, Patuxent River, MD, is the contracting activity. E3 Federal Solutions, Inc., McLean, VA, is being awarded a modification (0002) for a previously awarded firm-fixed-price contract for $8,406,420 to provide the Office of the Under Secretary of Defense for Policy executive administrative management and executive administrative services to support 38 separate offices headed by senior level individuals within the organization. Work performance will take place at the Pentagon in Arlington, VA. The expected completion date is Aug. 14, 2021. Operations and Maintenance funds are being obligated at the time of the award. Washington Headquarters Services, Arlington, VA, is the contracting office (HQ0034-15-A-0015).